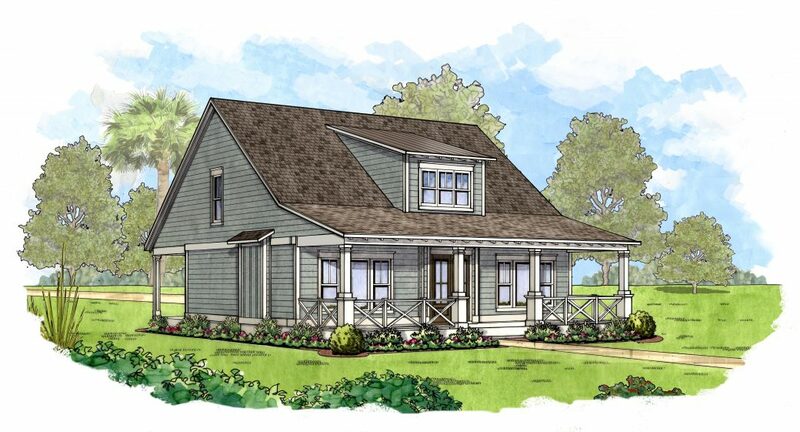 The Cottages at Parkside represent one of the most anticipated and unique offerings ever released at Hampton Lake. Surrounding Crystal Lake, the central feature of the new Parkside Amenity Center, the Cottages bring Carribean-inspired resort-like amenities immediately accessible to each owner’s backyard. The design of the Cottages is unique, featuring large and architecturally correct living porches on the rear of the homes. This “reverse” design harkens back to “front porch” neighborhoods of the past and encourages connection with friends and family. Connection to the 1/4 mile crushed granite path is situated just beyond each backyard while easy access to the Crystal Lake, white sand beach, and tiki huts is made through a number of access points along the lake’s protective timber fencing. Inside, the Cottages feature 10 foot ceilings, stunning kitchens, and open floorplans. Large, light-filling windows and french doors on the rear of the home look out to the bright blue waters of Crystal Lake. Logan Homes began building luxury homes along the southeastern Carolina Coast in 1986. Prior to that, D. Logan was introduced to the world of custom home building by starting first as a carpenter’s helper where he demonstrated the ability, attention to detail and attitude it takes to succeed as a builder. After working for four years building some of the finest homes along Wrightsville Beach and Figure Eight Island, he turned his dream into a reality and began Logan Homes. Along the way, Logan Homes has built a track record of success and customer satisfaction by exceeding customer expectations and turning dream homes into reality. The approach D. Logan takes hasn’t changed – personalized designs from contemporary to classic that go beyond client expectations, use of cutting edge technologies and streamlined processes that make building your dream home simple; as easy as 1, 2, 3. To this day, Logan Homes builds luxury homes for discerning clients throughout the southeastern coasts of North Carolina and South Carolina. 100sf walk-in storage area and optional golf cart garage bay.